Akron, Ohio, January 23, 2017 – Today, Mayor Dan Horrigan released public records and an interactive map that demonstrate the City’s proactive efforts to replace lead piping for residences and businesses throughout the City and to treat the City’s water with special chemicals that prevent lead from dissolving into the water supply. The information can be found at www.akronohio.gov/water. “In light of the situations in Flint, Michigan and other communities, I wanted the Akron public to know that regardless of whether or not their property is served by a lead pipe service, regular tests prove that their drinking water is clean and safe, far exceeding all EPA requirements,” Mayor Horrigan said. Importantly, having a lead pipe service does not indicate that water will have unhealthy levels of lead. The City’s comprehensive corrosion control program prevents dangerous levels of lead from entering the water supply. Unlike other cities, for the last three decades, Akron has continuously added a special corrosion inhibitor called “zinc orthophosphate” to its water which acts as a barrier between the metallic pipes and the water. This barrier chemically coats the pipes and helps prevent lead from dissolving into the drinking water. The City regularly tests homeowners’ tap water for lead and results show that the corrosion control program is working and that the City exceeds all United States Environmental Protection Agency (EPA) requirements. The City released, and published on its website at www.akronohio.gov/water, a color-coded, searchable map showing the locations of each of the active lead pipe services and non-lead pipe services throughout the City, for the convenience of customers and residents. The City also released a copy of the letter and frequently asked questions document that was mailed to every property owner with an active lead service in March 2016, and a list of frequently asked questions about lead and water. Residents with questions are encouraged to read the City’s letter and frequently asked questions posted on the City’s website or contact the Mayor’s Action Center at (330) 375-2311 or 3-1-1, with any specific questions. ahead of time if the algae in the lake poses the threat to create toxins gives the leadership team at Akron Water Supply the time and confidence to make decisions to prevent harmful algal blooms and to prevent toxins from contaminating the drinking water. Akron Mayor Jeff Fusco said "This is another example of Akron’s continued efforts to capitalize on global opportunities to take advantage of the latest technology to improve Akron’s water quality." The City of Akron is the first City in the United States to test a state-of-the art Algae Monitoring Device. Starting this week, the City of Akron Water Supply Bureau will begin testing a unique handheld monitoring device to measure algae in Lake Rockwell Reservoir, Akron’s primary source for drinking water. The device was developed in the Netherlands by BlueLeg Monitor, http://bluelegmonitor.com, and designed to quickly measure multiple water quality factors indicating the presence and quantity of algae. BlueLeg Monitor develops equipment and provides services to help water utilities such as Akron monitor the ecological quality of surface water. Algae identification levels and the treatment of algae by-products that may pose health threats have become serious issues for water utilities throughout the country. The prompt detection of an algae bloom provides Akron staff with an earlier opportunity to implement water plant treatment adjustments and preventive reservoir management techniques in an effort to minimize algae’s adverse effects. The Ohio Environmental Protection Agency has been at the forefront of this issue and has set aggressive testing standards for algal toxins, resulting in “do not drink advisories” for a number of communities, including the one issued by the City of Toledo last summer that affected nearly 500,000 Toledo water customers. On June 15, 2015 the U.S. EPA reinforced the importance of this issue by releasing national drinking water health advisory standards for toxic algae. The City of Akron was the founding member of the Akron Global Water Alliance, a group dedicated to identifying the best available technologies to address emerging water quality issues and spur economic development by improving access to clean, high quality drinking water. The BlueLeg Monitor was identified through this group’s work. This past April, the Alliance hosted the 2015 U.S. Algal Toxin Conference, which brought nearly thirty expert presenters and more than 200 water professionals from around the world to Akron to educate them on the algal toxin issue. 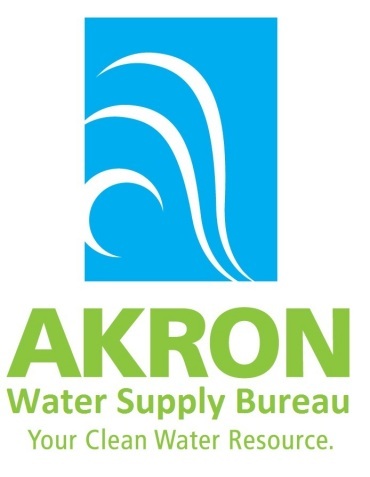 In addition, for nearly two years, Akron has hosted a series of quarterly water utility operator forums for the superintendents of northeast Ohio’s water utilities, where they meet to discuss algae and other drinking water issues. The City of Akron also has extensive research projects underway with the City of Akron Drinking Water Laboratory, the University of Akron and the Netherlands Water Alliance. This year marks one hundred years that the City of Akron’s Water Supply Bureau has been pumping drinking water from the Lake Rockwell reservoir. Today, the Bureau provides approximately 35 million gallons a day of drinking water to customers in the City of Akron and neighboring communities throughout Summit County. For more information, visit www.akronohio.gov/water, or call (330) 678-0077. Akron, Ohio (November 1, 2013) – The City of Akron Water Supply Bureau is pleased to announce the expansion of a current educational partnership with the Akron Public Schools providing students with innovative learning opportunities associated with the drinking water industry. Technical staff at the City’s Water Supply Bureau will now provide in-class presentations on an array of water related science and technology topics to students enrolled in Environmental Science classes at Buchtel, East and Firestone High Schools. In addition, Akron Water will offer transportation to students and faculty to visit Akron’s advanced drinking water treatment facility which will include guided tours, environmental education and research opportunities within the treatment plant, laboratory and protected watershed properties. “Akron Water has had an excellent educational partnership with the National Inventors Hall of Fame School - Center for Science, Technology, Engineering and Math and we are pleased to offer these additional educational opportunities to other Akron Public School science programs,” said Akron Service Director John Moore. The City of Akron also currently offers work-study programs at Akron Water including student intern employment opportunities for high school seniors and cooperative education employment opportunities for university engineering students. Akron Water serves nearly 280,000 drinking water customers throughout the City of Akron and many neighboring communities. If you have any additional questions regarding Akron Water or Akron Water educational programs, please visit the Akron Water website at www.akronohio.gov/wateror call the Akron Watershed office at (330) 678-0077 x437. October 18, 2013 (Akron, Ohio) - Yesterday, the City of Akron’s Drinking Water Supply Bureau hosted a 2013 American Water Works Association District Seminar at the Akron Drinking Water Treatment Facility. The event was attended by more than 200 water professionals throughout the State of Ohio including officials from the Environmental Protection Agency, municipal water supply operators, scientists, biologists, engineers and technicians. The attendees were provided with guided tours of the highly secured Akron facility and its 2 billion gallon Lake Rockwell drinking water reservoir. In addition, six hours of technical sessions were provided by presenters from throughout the United States discussing the latest advancements in drinking water treatment technologies and drinking water system management. Akron serves nearly 280,000 drinking water customers throughout the City of Akron and many neighboring communities. If you have any additional questions, please visit the Akron Water website at www.akronohio.gov/wateror call (330) 678-0077. September 20, 2013 (Akron, Ohio) – On the heels of a front page newspaper article warning of elevated levels of a specific algaltoxin in an Ohio water supply, Mayor Don Plusquellic announced this morning that Akron’s drinking water supply and raw water reservoirs havebeen recently tested by Ohio EPA and do not contain the offending algae. Earlier this month, a water utility in Northwest Ohio serving 2,000 customers issued a precautionary drinking water advisory because of elevated levels of a blue-green algae toxin called microcystin. In response to this most recent unique situation involving Algal toxins, and as part of Akron’s continuous effort to insure safe drinking water to our customers, the City of Akron and the Ohio Environmental Protection Agency once again reconfirmed this week that the Akron drinking water supply remains free of the Algal toxin. Akron serves nearly 280,000 customers throughout the City of Akron and many neighboring communities. If you have any additional questions, please call (330) 375-2420.